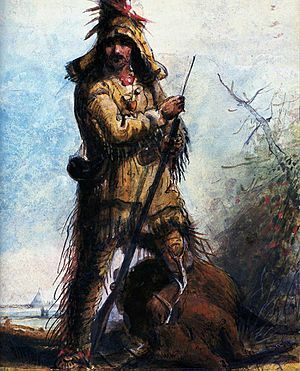 A mountain man was an explorer, trailblazer, and animal trapper in western North America. They flourished between 1810 and 1880. They were well known throughout the Rocky Mountains region. Famous mountain men include Jim Bridger, Kit Carson, and Jedediah Smith. By the mid 1800s the fur trade was no longer profitable. Furs were no longer popular in European fashion. Many of the mountain men settled into jobs as Army Scouts, wagon train guides and settlers through the lands which they had helped open up. Others, like William Sublette, opened up fort-trading posts along the Oregon Trail for the remaining fur traders and settlers heading west. The Greeting, by Alfred Jacob Miller. The Trapper's Bride (ca. 1837), by Alfred Jacob Miller, shows a trapper, Francois, paying $600 in trade goods for an Indian woman to be his wife. Mountain man reenactor or living historian dressed in buckskins. Mountain man Facts for Kids. Kiddle Encyclopedia.